In this post, we will discuss about the two most unused window identification properties – windowStyle and WindowExtendedstyle. While automating Windows based applications, uft’s object spy will show two properties windowstyle and windowextendedstyle. Often when we don’t have any values for the properties like name or class or if we are not able to identify objects uniquely, we think about using these two properties. In my case, I really never used them before, because I have an habit of understanding things first. I searched Internet couple of times but I was unable to find anything. Couple of years back I tried creating a framework for automating Windows based applications completely in C#.Net and while reading operating system structures I found two structures which are style and exstyle. I called the function on the window under test and got one value, next thing I did was to compare that value from the values obtained from uft’s object spy. It was 100 percent match. Good news is that i was able to complete the basic set of framework and these two properties played an very important role in that. One of the important question is, why windowstyle property is available for all object types, and not just only for windows ? and the answer is, in terms of windows operating system, every object drawn or exist and running within the system is a window, with different properties and appearance, some are visible and some are not, and that’s the reason why we get window style property for check boxes, radio buttons or for different controls. In this post, i will refer all objects as windows. As the name of the property suggests, it holds the bit level information about how an window will be displayed on the screen. The following information can be retrieved from style object. 1. window has border or not? 2. window is a child window? 4. Can it overlap other windows while drawing? 5. Window is first control of group? 6. Is window maximized when initially loaded? 7. Is window a popup window? 8. Is window having a vertical or horizontal scroll bar? 9. Window has Maximize/Minimize Button? 11. Window can receive Focus? Remember Window refer’s to all types of objects. What is Extended Style property? 1. Window accepts drag and drop? 2. Window title bar is having help button? 3. Window Reading order is left to right? 4. Is Window an MDI child? 5. Is Window Topmost window? 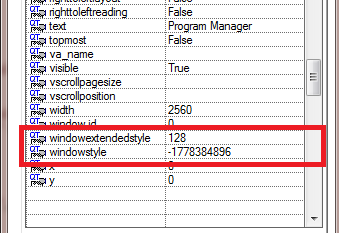 How to retrieve values from UFT’s windowstyle and windowextendedstyle properties? WS_EX_ACCEPTFILES 0x00000010L The window accepts drag-drop files. Note: The above constant values are in Hexadecimal, UFT will show long values, convert appropriately before performing operations. Bitwise And operator will only return an non zero number if the particular bit is set. Now, open an new notepad, title of the notepad should be “Untitled – Notepad”, otherwise change the title in the code. Run the code, it should display two message boxes, first with zero as it will not be able to find border around desktop and second non zero as code will be able to find border around Notepad window. Now, you have an understanding about these two properties and how to use them, lets discuss a little about, when we can use these properties. 1) WindowStyle property value can be used as it is when we know that actual programmers will not change any of the properties in future about the window appearance. 2) If, you cannot identify window uniquely, but there is a specific property within style or windowstyle properties which can be utilized, then you can use it to identify the correct window. One last important thing is Some of the properties are available already within UFT like “hasborder” property for which i have demonstrated the code above, only few of them are not included, So use these properties when its absolutely necessary.